One from a couple of days ago. Another stunner in every way. Great shot Alan. Simply beautiful. If it was mine, I may try to get more detail on the white feathers at the base of the tail, to see if it is possible. Super nice banking pose Alan! I agree with Enrigue, I would try to bring out the details if possible in the tail white section. That gets a "holy excrement" from me. What an outstanding image. Alan, wow, simply fantastic with ideal pose - LOVE it! Nailed! How's that for a banking pose! Beautiful detail and banking pose, Alan. Excellent. Outstanding photo- so clearly a harrier with those markings. I guess the white is a touch over, but it doesn't bother me too much. Overall, an amazing photo. Beautiful flared-tail back view, lined up perfect with your shadow line. The low half vegetation adds to this image. 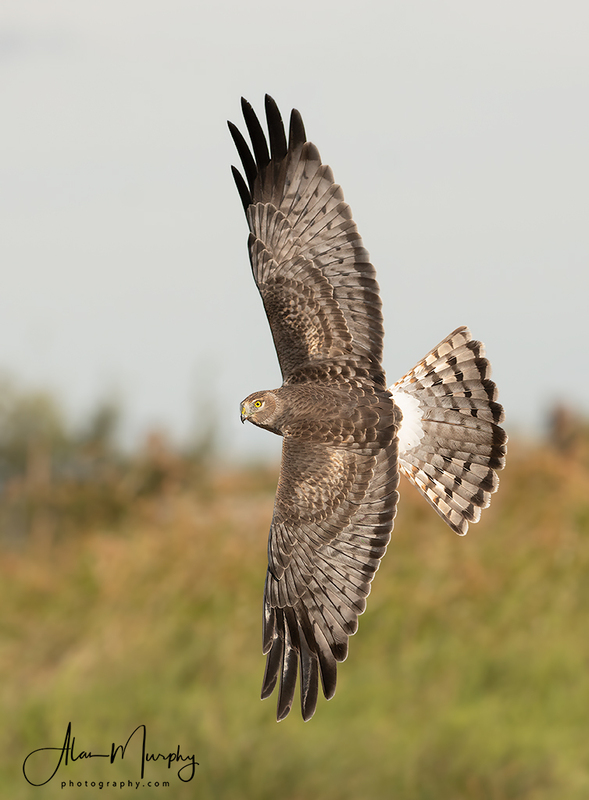 A superb capture of this magnificent harrier, Alan! The ultimate banking position shot, Alan. Couldn't ask for a better pose, superb shot Alan.